Nereid is a 47' Willard Dover pilothouse cruiser, built in 1966 in Costa Mesa, California, with a fiberglass hull and a wooden superstructure. She is one of only four of this model built. 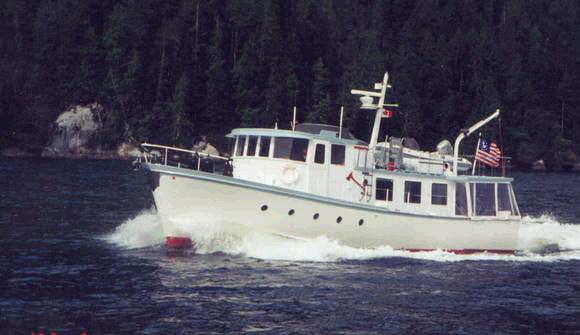 She was designed by Blaine Seeley, who also designed the Pacific Trawlers, and it's easy to see the family resemblance. We purchased the boat in April of 2003 and, after much discussion, changed her name from Ladyship to Nereid. Nereid is in a great shape for an old lady. The previous owners did a major refit in 1993, replacing the engines and updating the interior. Since we have owned the boat, we have redone the electrical system and have had the electric stove replaced with propane, had the fuel system upgraded, (including Gulf Coast filters), had the flying bridge rebuilt, and had a new teak upper deck laid. The wooden parts of the boat are now sound and will probably last longer than we do, especially since we now have Neried in a covered slip. After spending several years cruising on a sailboat, even though the sailboat had a pilothouse, we have found the comfort of the Nereid to be a pleasure. We quickly got used to the additional space and visibility of our new boat. The interior is light and spacious, but the space we use most is the large aft deck. At anchor, when the weather is fine, we open the curtains here and have a shady outdoor space right by the water. On chilly or rainy days, we close the clear curtains and turn the heater on, so we can still feel as though we're outside, but in complete comfort. Nereid's hailing port is Seattle, but she is berthed at Fidalgo Marina in Anacortes, ready to go cruising for a just a weekend or for as much time as we can manage (weeks, when we're lucky). Since,we just bought a larger slip, our Anacortes condo moorage is for sale.